As we enter another new year, a lot of emotions come up. As we clean up and reset our minds from the holidays, some of us feel overwhelmed about starting yet another year from zero, some of us feel nothing since we have started many new years with not much changing, and some of us may be feeling a new stirring within our souls. A little sense that you are willing for a new perception to come to you so that you might walk through this world in a lighter and more connected experience. Perhaps a feeling where you truly know that everything you need for your awakening, your salvation, is available to you right now. So, if you are ready, let’s MacGyver a miracle! Do you remember the TV show from the mid 80s in which this very clever guy named MacGyver could figure his way out of anything? When I was living through that time, I really didn’t pay much attention to the show. When our son Jeff came along, I kept thinking how much he would love it. As luck would have it, when Jeff was about fifteen years old, MacGyver was being rerun on a local television station, so we decided to watch the entire seven seasons. Jeff loved it – and I found some real insights. Now, there’s a new MacGyver on TV, but it still has the same ingenuity and humanity we came to love in its first incarnation. As always, there is never a problem too big or too complicated for MacGyver – a good lesson for all of us to remember. Here’s MacGyver’s approach to problem-solving: 1) He knows everything he needs to get out of a problem is right here, now, 2) He never takes anything with him into his problems (except perhaps his Swiss Army knife), and 3) His solutions are based on helping, not harming. To me, that’s similar to what A Course in Miracles is asking us to do to experience a miracle. The Course reminds us we have all that we need within us now to experience the miracles that are present for our salvation, our healing. We don’t need to bring any limiting or preconceived past thoughts with us into the seeming problem, as they can block the answer. 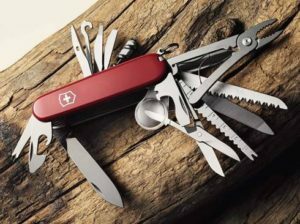 All we need is the Holy Spirit — the miracle workers’ Swiss Army knife! And, we need to always remember the answer will be one where no one loses and everyone is blessed. Our goal is that we do not see our interests as apart from someone else’s. Whenever MacGyver got into a jam (and that was every episode, of course! ), he was always able to figure his way out. That’s what everyone loved about the show. Everyday items became his “salvation” to a locked door or a ticking time bomb. He knew he had the knowledge. He would always stop, focus within (and we always got to hear what he was thinking in a voice over), and look for the answers he knew were all around him. I know most of us think, well that’s a TV show or we aren’t as smart as a MacGyver, but the fact is, we have the infinite knowledge of the universe available to us. That is what we are being told in the above passage. Jesus is reminding us to stop the limited thinking, focus on the power of God within us now, and know all that we need is here right now. The Voice for God is here to help us through whatever problem faces us today. We are not alone; we only feel alone because we do not acknowledge the power by choosing to listen. Again, the choice to listen is not a denial of the world where you are sticking your fingers in your ears, closing your eyes, and screaming, it is a correction from the diminishing thoughts of the ego that say you are lost, hopeless, and incapable. The ego is not you, and no matter how long you have listened to it or how comfortable it has become to you, it will never be you, therefore . . . “Put not your faith in illusions. They will fail you. Put all your faith in the Love of God within you; eternal, changeless and forever unfailing. This is the answer to whatever confronts you today.” (W-50) It’s time to stop listening to the limited thinking of the ego and open your mind and heart to the miracles that are here to transform your life right now. 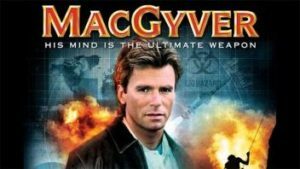 When MacGyver went on a mission, he never took anything with him because he knew he had the knowledge to handle any problem. He did, however, carry a Swiss Army knife. Now, if you know about these knives, they can have every tool in them for any emergency, conveniently tucked into a compact size that fits into a pocket. They’re like a survival tool for most any situation — much like we are told the Holy Spirit is for us. 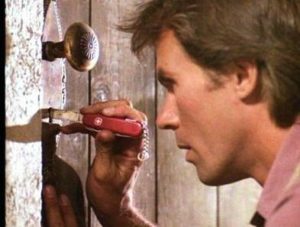 MacGyver felt he only needed his Swiss Army knife, and we only need the Holy Spirit. First, however, the Holy Spirit can only offer this vision if you are willing to bring Him into your thinking. MacGyver knew he needed his trusty knife, and we need our trusty Helper. Therefore, once we realize the importance of the Holy Spirit’s vision in our lives, we have to get out of the way and bring our thoughts to Him for healing. Once we value the Holy Spirit’s help over our own, He sorts through our minds and selects the elements that represent the truth “and disregards those aspects which reflect but idle dreams.”(ibid) In a MacGyver episode, if he was locked in a basement, he would look for only the necessary items to facilitate his escape. He didn’t sit around looking at all the items that made him feel small and powerless or bemoan the fact he was in the mess in the first place. Therefore, here’s a MacGyver a miracle tip: Don’t hold onto the thoughts that don’t serve you. Stop dwelling in them. Let the Holy Spirit sort them out for you. Next, the Holy Spirit will “reinterpret all you see, and all occurrences, each circumstance, and every happening that seems to touch on you in any way from His one frame of reference, wholly unified and sure.”(ibid) MacGyver saw everything as helpful. He wasn’t happy he was in the problem, but once he was in it, he didn’t whine; he went to work. So, let’s get to work and let the Holy Spirit reinterpret all you see. It is not that we are thankful for the problems in our lives, but we are grateful we have the available Answer in the Holy Spirit that can create miracles out of our messes. Finally, the Holy Spirit’s frame of reference is love, so He will focus on “the love beyond the hate, the constancy in change, the pure in sin, and only Heaven’s blessing on the world.”(ibid) Like the Holy Spirit, MacGyver always had a single frame of reference: Finding a solution to any problem put before him. From the Course’s perspective our solution is love, and that is what the Holy Spirit’s laser focus is here to help us experience. As the Course would say, the Holy Spirit is here to help us experience everything as an extension of love or a call for love. This type of focus allows us to move past the distractions of the ego and focus on the miracle that is being offered in this moment. Imagine that type of attention centered on our healing. The Holy Spirit is not distracted by the ego’s thoughts about your past mistakes or failures, or anyone else’s. He knows the important thing is not blame or guilt, but awakening; that’s what He is here to help us do. We just need to accept His Help, and we have ourselves a miracle! In the original series, MacGyver worked for a non-profit organization called the Phoenix Foundation, whose goal was to better the lives of people and communities around the world by coming up with solutions for their problems. Of course, no one was better at helping than MacGyver. Part of MacGyver’s strength was his motivation to help others. He always recognized that when he helped another it made everyone’s life better. Let’s go back to the above passage from chapter four in the Course’s text because it emphasizes a very important point. When we distance ourselves from others by not seeing their interests the same as ours, we are distancing ourselves from our real power and strength. When we hate, fear, or attack, we do not become stronger, we are weakened and we feel separated from our Source. It is not that God is distant from us, but we have distanced ourselves from Him by denying the truth of His Creation (each and every one of us). We cannot hear or know His Answer for us because we are refusing to tune into His consistent call to love. Think of it this way, when you plug a lamp into an electrical socket, it is connected to a lot of power. But, unless you turn on the lamp’s switch, the power is unrealized. In much the same way, you are connected to a mighty source of miracles, but when you hate or value separation, this real power is unrealized to you, although it is all around you. Recognizing that our salvation is found in our relationships with each other does not mean we have to agree with or condone actions that are harmful. We can and will disagree in this world, but we do not have to be disagreeable and make others wrong or hated to make our points. 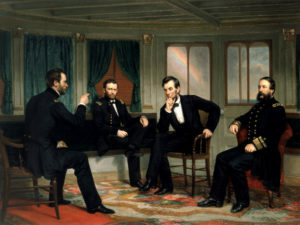 In her book Team of Rivals, historian Doris Kerns Goodwin tells how during Abraham Lincoln’s presidency, he intentionally brought into his administration knowledgeable people who had disagreed with him. He did not see those of differing views as enemies, but as people who had deep felt opinions that were simply different from his, and he felt he could learn from them for the betterment of the country. It did not mean he acted upon everything they thought or said, but by listening and discussing, both sides were able to move past the blocks that separated them to find collaboration. The Course assures us we will awaken to the truth of our divine nature as God’s Holy Child, with all the support, healing, and joy this awareness brings us. Let us accept “the holy instant as this new year is born,” meaning be open to the Help that is available to you now and not delay your healing a moment more. Just like MacGyver, we need to know we can handle whatever situation comes to us today. Let us be willing to look at the problem, step back from all past perceptions of right or wrong, good or bad, and come with an open mind to the situation so that we might share vision with the Holy Spirit and see the miracle that is standing here now. Okay, you have everything you need already given you to handle any problem which you may face. Your salvation is now. It’s time to MacGyver a miracle for the New Year!